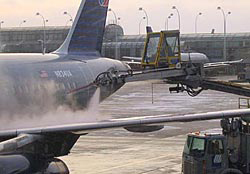 Airlines spray de-icers and anti-icers onto an aircraft, as required by Federal Aviation Administration guidelines in icy conditions. While de-icers are decreasingly toxic, anti-icers contain chemical additives that may continue to endanger aquatic ecosystems. Image is courtesy of the U.S. Environmental Protection Agency. What keeps passengers safe when they fly in the winter may not be as safe for ecosystems. Researchers examining the environmental harm done by airplane de-icing and anti-icing fluid runoff have found that such runoff from airports located near bodies of water  including 45 of the 50 busiest airports in the United States  could spell trouble for aquatic ecosystems. Although de-icer fluid is known to be toxic, de-icers have generally become less harmful since the mid-1990s, says Steven Corsi of the U.S. Geological Survey (USGS). But anti-icers  de-icers with additives that help the fluid stick to the surface and prevent the formation of new ice  have stayed just as toxic, he says. In a new study published in January's Environmental Science & Technology, Corsi and his colleagues found that the additives used to make anti-icers are likely to blame for the high toxicity found in runoff at General Mitchell International Airport in Milwaukee, Wis. Airports use de-icers to remove ice from planes before takeoff, spewing between 100 and several thousand gallons per aircraft with each application, depending on conditions. Some of the fluid sticks to the plane, but 75 to 80 percent escapes into the surrounding environment, according to a 1995 Federal Aviation Administration report. The bases of all de-icing fluids are propylene and ethylene glycol, which are also used as antifreeze in cars. However, anti-icers include additional ingredients, which are manufacturer-specific trade secrets, and manufacturers are not required to publicly name their additives, says Ian Hartwell of NOAA, who published initial studies examining the effects of aircraft anti-icers and de-icers on ecosystems in the early 1990s. Like Coke and Pepsi, the basic formulations may be essentially the same, but their minute differences constitute their market competitiveness, Hartwell says. In the new study, Corsi's team compared the effects of nine different anti-icing formulations on organisms at the bottom of the aquatic food chain, such as water fleas, algae and fathead minnows, residing in the waters around the airport. "We design the tests so that we get a toxicity response," says co-author Steven Geis, an organic chemist at the Wisconsin State Laboratory of Hygiene. "Once we know the toxic concentration, we can look for it in waterways near the airport and predict what it's doing to aquatic life in the stream." The effects ranged from stunted growth to reproductive problems and death, Geis says. Neither the primary nor the known secondary ingredients in the anti-icers could account for the toxicity measured at the airport, however, suggesting that the unknown additives may be to blame. Determining which chemicals might be behind the toxic effects is difficult, however, because the specific chemicals added to the anti-icing fluids are such closely guarded secrets, Corsi says. Businesses use a variety of chemical additives to improve their anti-icers, each with a different effect: While some prevent corrosion or thicken the fluid for better application, others inhibit fire. "When you spray anti-icer all over this enormous machine, you have to make sure you don't set it on fire or short out the electronics," Hartwell says. The additives can be "quite toxic," he says, but the formulations are so complex that researchers "can't just go in and take a sample and say 'this is what's toxic.'" Corsi and others have called for the anti-icer manufacturers to make their ingredients public, because until the chemicals are known, "these contaminants will be released without public knowledge of their environmental impact," Corsi says. "We can't study them properly to determine what their true effects are, because we don't know what to study." Until manufacturers themselves come up with less toxic formulations, Corsi is working with a team of researchers at seven organizations to identify some of the ingredients that cause the problems, such as hormone disruptions, that can make their way up the food chain. The goal is to create new, environmentally friendly formulations, "and then suggest alternative components to the currently toxic ones," Corsi says. The U.S. Environmental Protection Agency is currently developing stormwater runoff guidelines for the airport de-icing category. In the meantime, some airports are going to great lengths to keep the toxic runoff from escaping into the environment. At Baltimore Washington International Airport (BWI), located in the sensitive Chesapeake Bay watershed, three de-icing pads collect jet runoff, which drains into two 600,000-gallon underground storage tanks. One pad can simultaneously de-ice seven jets. Building such structures is expensive: BWI's runoff reclamation project cost the airport more than $10 million. But these pads reclaim up to 80 percent of the estimated 35,000 gallons of fluid lost per day, which the airport can recycle  saving money, as well as helping the environment, Hartwell says.